(1) A good quality print-on-demand paper copy for $12.60 (about £7.50) is also available from HP MagCloud. Sorry that the sums are in dollars, but the printing is done in Europe and delivery times are usually no more than a week from order. Inspiring Change: evaluating arts and justice initiatives (.pdf 1.7MB) Richard Sparks and Kirstin Anderson reflect on lessons learned from their involvement in a multi-disciplinary research team evaluating the Inspiring Change programme of arts in Scottish prisons. Should Prison Architecture be Brutal, Bland or Beautiful? (.pdf 1.3MB) Yvonne Jewkes and Dominique Moran considers the significance of prison architecture and design. The Journey: co-production and performance in criminological research (.pdf 1.2MB) Lesley McAra tells of her involvement as a researcher in a project for homeless and deeply excluded people that focused on a collaborative performance. She argues that creativity has a role in healing and inclusion. Every Person, Every Voice: an exploration into the making of devised theatre in prison (.pdf 1.2MB) Jess Thorpe considers her work as a drama tutor in HMP Perth devising theatre with prisoner groups. Music in Scottish prisons: a new direction? (.pdf 1.2MB) Kirstin Anderson reviews music provision in Scottish prisons. 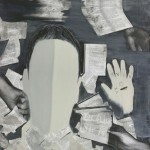 Questioning audiences: reading and writing in prisons (.pdf 1.2MB) Kate Hendry on how literature can reclaim the role of the questioner for prisoners, to understand and make sense, and how writing can be the starting point of a conversation, building an awareness of the audience beyond the prison. 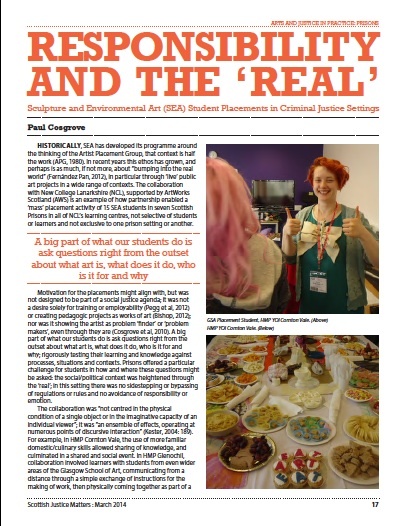 Responsibility and the ‘Real’: Sculpture and Environmental Art (SEA) student placements in criminal justice settings (.pdf 1.3MB) Paul Cosgrove on a placement programme in prisons – offering a particular challenge for students – no avoidance of responsibility or emotions in sharing the ways they learn. 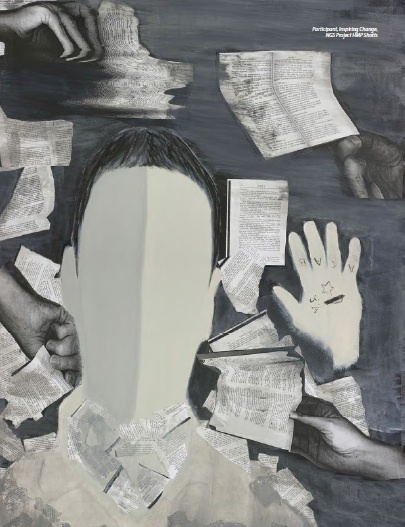 Making women visible: creative practice within prisons (.pdf 1.2MB) Kevin Harrison and Lorna Callery on the Freedom to Create project for women in HMP Cornton Vale and other places in Scotland. WOW – Women only Workshops Alloa: innovation in community justice and arts for women (.pdf 1.2MB) Emma Wilson on how the arts, creativity and learning together can improve self confidence. 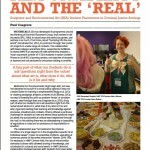 Connecting people: community justice and arts (.pdf 1.2MB) Justina Murray reports on the impact of Creative Scotland and the Big Lottery Scotland’s arts in community justice programme. 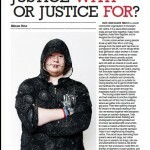 Justice With or Justice For? (.pdf 1.2MB) Alison Urie on Hot Chocolate, Dundee as a place involving young people in creativity and imagination arising above the grit, grief and frustration. Lieux Fictifs: art in Marseille Prison, a process of displacement and change (.pdf 1.4MB) Caroline Caccavale on long standing visual and audio arts training in Marseille Prison to engage prisoners in a comprehensive process of change. Evolving Artist (.pdf 1.2MB) Nancy Loucks speaks with Wullie Sinclair, the founder of Evolved Arts, a new peer-led arts project to support people in the criminal justice system in Glasgow. Find lots of additional material, links and videos on arts and justice with a Scottish focus on our Pinterest board. Time for Change: advocacy and empowerment for Scotland’s high risk young women (.pdf 1.3MB) Gail Wilson on the work of the Up-2-Us Time for Change project working with young women in the west of Scotland facing severe and multiple disadvantage. Take Five. 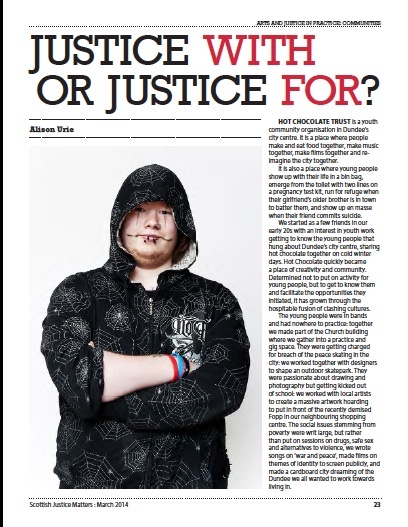 SJM asks ours politicians, what should smart criminal justice look like at a time of major cuts in public spending? (.pdf 1.2MB) Graeme Pearson MSP, Margaret Mitchell MSP, Patrick Harvie MSP, Alison McInnes MSP and Kenny MacAskill, Justice Secretary respond. Public Social Partnerships: the way forward for better justice services in Scotland? (.pdf 1.2MB) Rob Strachan on how PSPs are a possible way forward for the design and delivery of justice services as an alternative to privatisation in the context of defecit reduction. 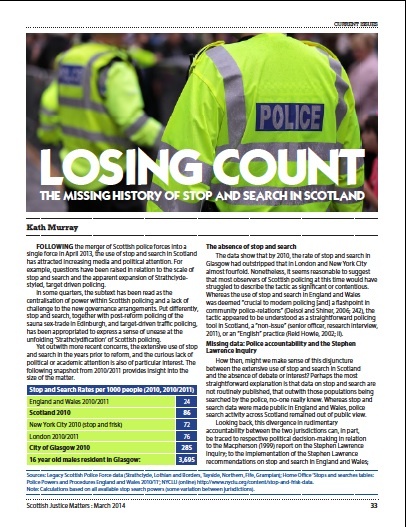 Losing Count: the missing history of stop and search in Scotland (.pdf 1.2MB) Kath Murray on the consequences of the failure by Scotland’s police forces to implement the Macpherson report following the Stephen Lawrence inquiry and question of stop and search. 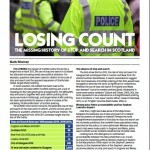 She calls for a wider debate based on robust and accessible data on stop and search in Scotland. Towards a new approach to restorative justice in Scotland: a short history (.pdf 1.2MB) Mary Munro and David Orr review key events in 2013 that may radically alter the prospects of developing a more effective restorative justice policy and practice in Scotland. Prison population forecasts: using the future to predict the past (.pdf 1.2MB) Sarah Armstrong takes a critical look at prison population forecasts and asserts that growth is caused by policy choices so that we can regain control over the future. 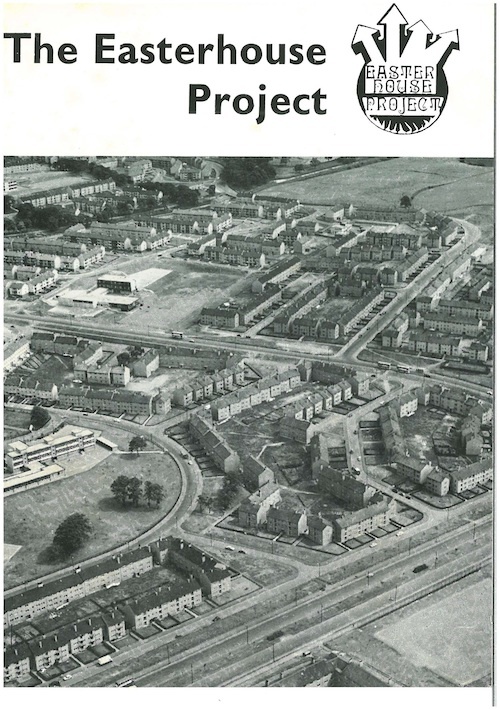 The Easterhouse Project: youth, social justice and the arts in Glasgow, 1968-70 (.pdf 1.2MB) Angela Bartie and Alistair Fraser report on their research into the Easterhouse youth project and its connections to the Glasgow arts scene of the time. A Potential Juror (.pdf 1.2MB) Andrew Tickell on the experience of being cited for jury duty at Glasgow High Court: an ‘original, strange and intimidating’ experience. 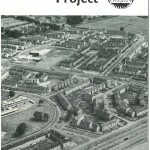 City of Gangs: Glasgow and the Rise of the British Gangsters, Andrew Davies, 2013, Hodder and Stoughton (.pdf 1.2MB) Review by Mike Nellis who says that ” the fact that not everything is new in this fine book on Glasgow’s gangs in the 1920s and 1930s is itself a commentary on the hold that ‘gangsters’ still have on Glasgow’s own imagination. and on outsiders’ perceptions of its history”. The Arts of Imprisonment: control, resistance and empowerment, Leo Cheliotis (ed), 2012, Ashgate. Review by Jo Buckle who is left with a sense of hope. 1 Pings/Trackbacks for "Arts and justice issue: March 2014"